Official game logo is not completed, and this does not represent the layout or graphic elements at all. But I need some sort of mock-up with which to show what needs to be on there so a more talented person can then make it pretty, and I thought I'd give you guys a look. Also, the encumbrance list is not yet finalized, but it'll look something real close to that. Every game played brings something better but not yet where it needs to be. I do want the character sheet to have pretty much all of the mechanical issues related to the game right there. The "dots," well, everyone gets one dot to start with in everything but languages and spell-casting abilities to represent the 1 in 6 chance. Halflings of course have better chances at certain kinds of hiding, elves finding secret doors, etc. Specialists will add dots in several places of course. This isn't supposed to be any sort of general skill list, but rather a sum-up of various class skills (most of which anyone can attempt, but certain classes just do better). Only fighters, elves, and dwarfs have the second two attack options, so those players can fill in those dots. There can be a back sheet to keep track of items, retainers, money, property, and investments, but I wonder if that's even a good idea - those things change so often. But I suppose it should be there. New rules update posted later today (Friday) and new Tutorial version off the the editors. May have new logos to show everyone soon as well. The encumbrance system still needs work tho I think, counting all the items is a bit of a pain (I'd keep a count of just the big/heavy items). "Experience Needed For Next Level"
Haha, no, I'm just not down with the "Experience Needed For Next Level" section on character sheets. Just a strong personal preference. Why are the ability scores out of order? 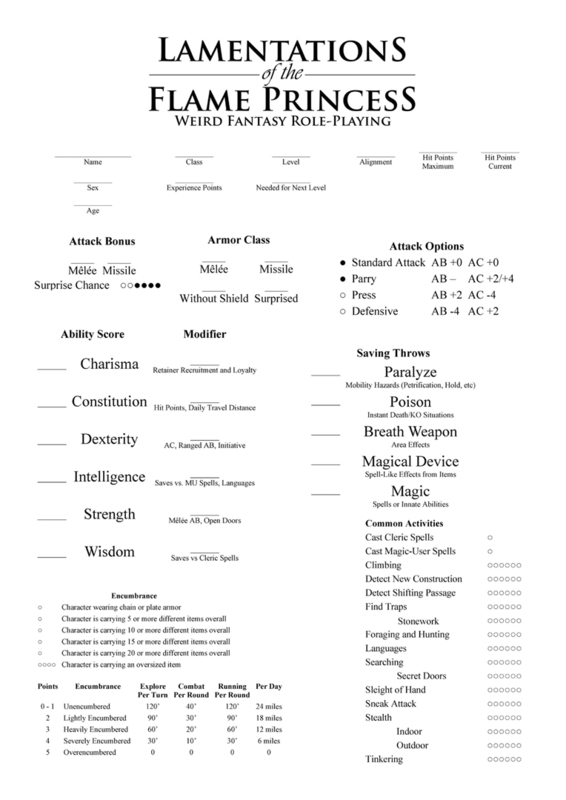 I'd suggest to just make a checklist that will help the DM teach newbs how to make their own character sheets? Newbs are always either intimidated or put off by a bunch of stats, boxes, circles, and formulas. All a newb really needs to know initially are about the six ability scores and what the modifiers are for. 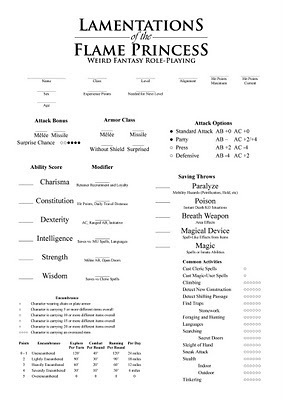 Maybe that in itself could be the character sheet, w/ the reference sheet to help the DM guide newbs to make the rest of the sheet themselves. >>Why are the ability scores out of order? The scores have been in different orders in different editions anyway. I just made them alphabetical. >>Newbs are always either intimidated or put off by a bunch of stats, boxes, circles, and formulas. I don't think there's even a way to determine if this is true or not. My thought is to keep people from needing to reference the books. The tutorial book will have a full rundown of what everything means. I agree with you, but at the same time plate armor is not by itself immobilizing. It's not good for longterm use, but in battle, a guy in plate with a sword and shield can move around pretty well - it would be suicide to go on the battlefield if it restricted movement that much. But the ease of use brought by approximation and estimation is better for gaming I think than worrying about strict realism in these matters. I think I'm in the right area here, even if certain details end up "unrealistic." I always put that on my sheets; it might be worth suggesting to new players in your tutorial that they should just write down the actual total needed, not how many they have yet to go. I've seen some of my newbs do this - change the 'needed' each time they get xp so it's counting down to zero, presumably because they saw it done in some video game or other. So a brief note to that effect in the tutorial might be a kindness. A great move! I've often seen players react to ability order as an order of importance; doing it this way will either break them of that habit or at least keep them from seeing CHA as a dump-stat. Maybe. I've always been inclined to treat 'plate armor' as being mostly chain with breastplate and certain other bits, or something like the Roman Lorica Segmentata, rather than the full-body Gothic armor of the early Renaissance. Thus, counting for a single point works fine. The only thing I'm leery of is the listing of common actions. Although I like the use of dots as a friendly visual for new players, I'm not totally convinced. I've usually found that a list like this, even if not intended as a 'skill list,' tends to encourage "choosing from the menu." My concern would be that inexperienced players faced with your 'monster-in-a-hole' would be more inclined to look through the list for something they "can" do, rather than thinking through the scenario and tying a chicken to a pole. Hopefully your continued playtesting will disperse that concern, but i do hope you take the time to test that out in particular. OdRook: "...that they should just write down the actual total needed, not how many they have yet to go. I've seen some of my newbs do this - change the 'needed' each time they get xp so it's counting down to zero, presumably because they saw it done in some video game or other. So a brief note to that effect in the tutorial might be a kindness. " I'm an idiot....I've always assumed this was the space for a running total of needed exp! WIth your explanation is actually now makes lots of sense. I rescind all previous negativity re. the experience needed section! I've taught a *lot* of people to play in the last 20-ish years. Some ideas that I was once astonished anybody would ever conceive of have proven to be common pitfalls. I attribute it to brainy people who overthink things that should be simple. So, while I'm not a proponent of the kind of mass-market hand-holding dumbing-down that leads to the land of rule-enforced FUN, I do think it's useful for a 'grab the newbies' product to anticipate some of these odd little quirks. And again, since so many people I introduce to the hobby are coming from a background in computer RPGs, I find it very helpful to know and highlight both the similarities and differences.